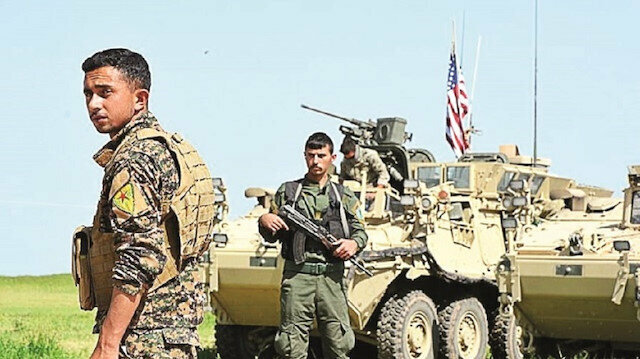 A convoy of Kurdistan Workers' Party (PKK) terrorists has pulled out of the flashpoint area of Manbij in northern Syria, close to territory controlled by Turkey, Syria's defense ministry said on Wednesday. Some 30 km (20 miles) from the Turkish border, the town occupies a critical spot on the map of the Syrian conflict, near the junction of three separate blocks of territory that form spheres of Russian, Turkish and - for now - U.S. influence. "According to information, approximately 400 have left Manbij so far," the Syrian defence ministry said. Their departure was in line with an agreement "for the return of normal life to the area of northern Syria," it said. The ministry showed online a video of dozens of vehicles travelling along an unmade road carrying armed terrorists, some waving the so-called flags of People's Protection Units (YPG) and its female counterpart the YPJ. Fearing an attack by Turkey after a U.S. pull-out from Syria, the YPG asked Syrian government forces to deploy in the area around Manbij. There was no immediate comment from the YPG or the SDF on the withdrawal or on how many terrorists might remain in Manbij. The PYD and its military YPG wing are Syrian branches of the PKK, which has waged war against Turkey for more than 30 years.